The 18-year-old has already scored twice for the Real Madrid B team. 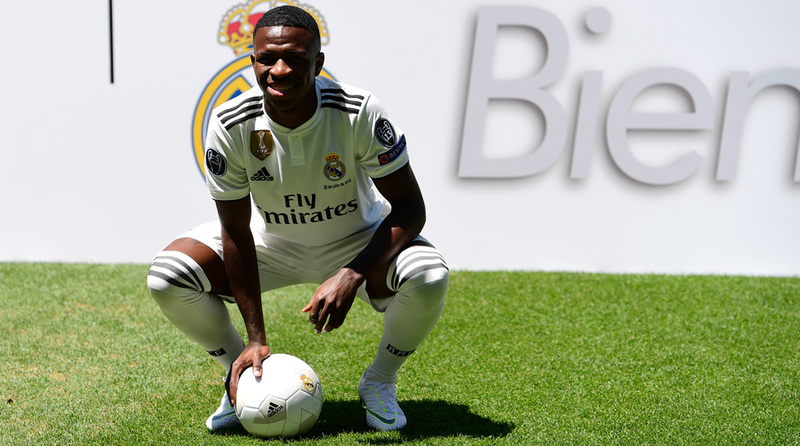 Vinicius Junior may not have scored a goal for the Real Madrid senior team till now, but it appears the day isn’t far off from when the 18-year-old will be making the net bulge with a golazo of his own, after a video of him executing a bicycle volley has gone viral on Instagram. The teenager made headlines around the world when Madrid signed him, then only 17, for a staggering fee of €46 million. Due to age restrictions, the teenager spent another season with boyhood club Flamengo before linking up with Los Blancos in the summer this year. He’s been prolific in the Segunda Division so far, with two goals in as many games and if he keeps scoring golazos in training, a senior debut may be forthcoming. Vincius’ issue is the wealth of attacking options at Julen Lopetegui’s disposal, even with Cristiano Ronaldo’s departure to Juventus. With Marco Asensio, Karim Benzema, Gareth Bale, Isco and Lucas Vazquez all competing for a starting spot up top, Vinicius’ chances of playing for the senior team are slim, barring any unforeseen injuries or suspensions. Madrid, along with arch-rivals Barcelona, are topping the La Liga table with nine points after three games played. The capital outfit next play Athletic Bilbao on Saturday night and will bid to keep their 100 per cent start to the season intact when they take on the Basque outfit. .